This elegant apartment in the middle of downtown, between Astoria and Deák Square, is a perfect starting point to discover both Pest and Buda. 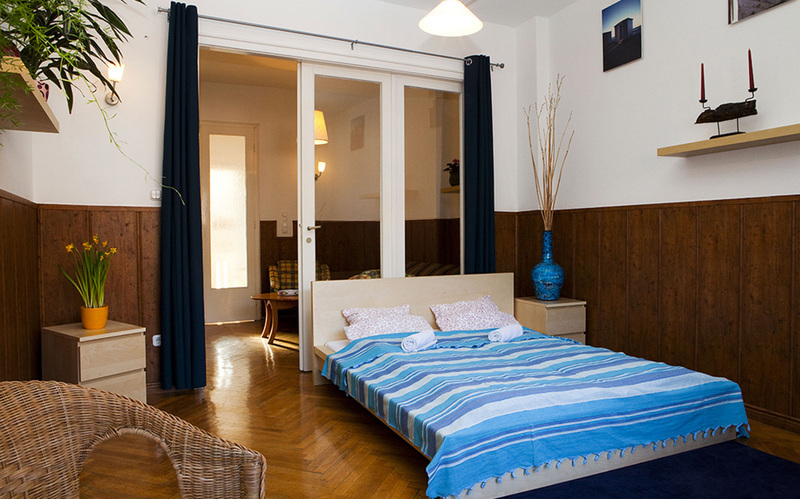 The elevator takes you to the sixth floor, where the nicely renovated flat in Beach House Style offers two bedrooms, both with balconies, and a splendid view to Gellért Hill and the Freedom Statue at the Citadella. In the spacious and well-equipped kitchen and dining room you can cook for any nation’s taste. The apartment can comfortably accommodate five people in three separated spaces. TV, WiFi, washing machine and ironing possibilities are ready for your service. Enjoy the vibration of the university area. The National Museum, The Petőfi Literary Museum and a hidden pearl of downtown: the Károlyi Garden, are just a couple of steps from the apartment. If you start walking in the direction of the Danube, you will find the nicest shopping streets, with both worldwide brands and folk art, antique stores and even trendy design shops. Bus and underground lines are five minutes away from the flat, so you can map any part of the city and get home easily even after a long night out.